With the advent of technology and the internet massive volume of information is available at the click of a button. Hence, it is often difficult to sieve the right information at the right time. Therefore, if you are planning to study abroad, then just browsing on the internet is not enough, you may need help of an educational consultant to select a suitable foreign University. So a very common question you may come across would be: how to choose the right educational consultant? Here it is. In this article, you will find detailed tips for choosing the right educational consultant. Just like how a doctor knows how to prescribe the right medicine, a teacher knows how to teach, an educational consultant knows universities and schools abroad! But, first a brief background. Many students across the country aspire to study abroad, because the international schools provide top class infrastructural facilities, quality education, global exposure and well-paid jobs. If you are planning to study abroad, then you will need to decide the right country, right university, right college or school and the right program. Finally, what you need is to find the best fit between the school/ program and the student's aptitude and career choice. This search is something, which cannot be carried out alone. Parents and the child need to jointly execute a well-planned methodology to save time and money and get the best-fit program of choice. This is where educational consultants come into the picture. This is because the process of choosing an experienced educational consultant can save efforts and money and ensure that you get admitted to the desired course in a timely manner. Overall, the main benefit of the educational consultant is to help the applicant in finding the best fit course in a university abroad. Help in arranging travel, foreign currency, travel insurance, budgetary accommodation, airport pickup, and even bank account , mobile service and insurance in the foreign country. Check previous history of a university/college aboard recommended by the consultant. 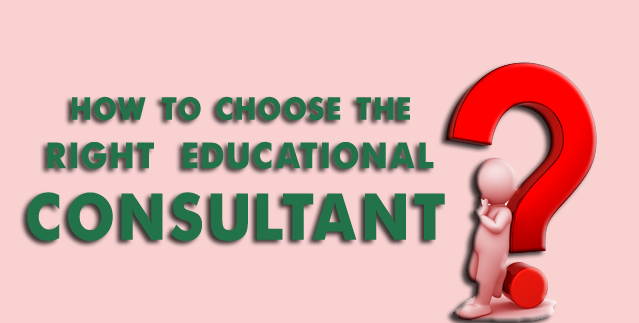 Once you have shortlisted a few educational consultants, the next step is to select the right one. One meeting or an interaction is enough to understand the traits of an educational consultant: whether interest is in you or in promoting own business. So instead of directly fixing up with the educational consultant, it is important to visit/ call the consultant. Note that interaction with the telephone operator or a junior is not enough. A face-to-face meeting or a 15 minute discussion on phone is a good tool to judge the points listed below and then finalize the consultant. Education is an important event and will define your future, hence a country/ university/ school or college /program has to be chosen judiciously. You need to be reassured that the consultant is working for your cause and not just his! I feel that the right educational consultant is the one who possesses at least 80% of the above traits. All said and done, once an educational consultant has shortlisted the abroad university/ college/ program it is critical that you review each of the websites of these foreign universities in depth and clarify if this is really what you want to go ahead with. To conclude: Choose an educational consultant with care and I am sure he/ she will give you the best fit of the program which you desire and this in turn will provide a jump in your educational path.